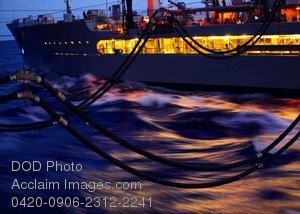 Description: Aircraft Carrier USS George Washington and Oiler Ship the USNS John Ericsson at Night. The Military Sealift Command fleet replenishment oiler USNS John Ericsson (T-AO 194) pulls alongside the aircraft carrier USS George Washington (CVN 73) during a replenishment at sea while underway in the Pacific Ocean on June 13, 2009. DoD photo by Petty Officer 3rd Class Charles Oki, U.S. Navy.